Crawley Town verdict: Is Glenn Morris the best keeper in League Two? In football you don’t always get the results that performances deserve. That has very much been the case in Crawley's last two League games. I’m not going to dwell on the reunion with Harry Kewell’s Notts County last week. Because to do so may well increase HK’s ego just a notch higher and we wouldn’t want Harry’s head to expand anymore. All I will say is that if we’d had our shooting boots on, then we would of put County to bed by halftime. 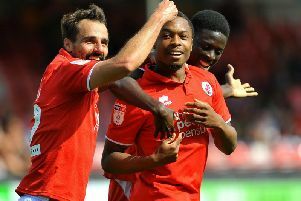 As it turned out over twenty attempts for the Reds only managed to produce a late consolation goal for Dominic Poleon in a 3-1 defeat. It just wasn’t our night. Not helped by some woeful defending for their goals. It’s also no surprise that when Mark Connolly and Bondz N’Gala don’t make the team we struggle defensively big time. But we swiftly put that game to bed on Saturday with yet another home win as Gabriele Cioffi maintained his 100% winning home record with a 2-0 win over Cambridge Utd. Although the score certainly didn’t reflect the game either. As it took Crawley a long time to get going, after Cambridge had missed several opportunities and that man again Reds keeper Glen Morris had kept the U’s out. It’s quite unbelievable that Glenn was initially brought in as a coach. He is probably the reason we have survived in the football league over the past few seasons. He is without doubt one of the best, if not the best keeper in League Two. A view not just shared amongst Crawley fans, but that of the majority of opposing supporters too.